I’ve been pondering getting a ProClick P50 binding machine for quite a while. I think the first place I read about it was in this post over at Our Busy Homeschool, one of the many great homeschooling blogs I read. Homeschooling involves a lot of paper — workbooks, printable worksheets, projects, planners…and the list goes on. The last couple years I have taken stacks of items to be bound at either an office supply store or a printing shop. The cost and time involved adds up quickly, but I so love having books that can lay flat or be easily kept open to the proper page. I got an Amazon gift card for Christmas, plus I got a couple of small gift cards as “thank you” gifts early in the year. After buying a few books from my wishlist, I still had almost enough left to buy the ProClick and the spines. As a treat to myself, I went ahead and splurged a little past that gift card amount to buy my binding machine. I bound my first item earlier this week — a stack of worksheets for Miss M from a “Read and Understand Science” book. Instead of loose copies flying around, they are now neatly in one of her school drawers, taking up less space than they would in a binder. I have visions of many things I’ll be binding in the coming weeks and months — custom coloring books for the boys? Math practice pages for Miss M? Pages for Miss M’s “lapbook” on horses that she is currently working on? A new-and-improved planner for me? Don’t mind if I do! While this is definitely not a necessity for homeschooling, I think I will have a lot of fun with this tool! I really really want a pro-click binding machine too! I’ve got some money from Swagbucks saved up. Might just have to splurge! I have been considering the purchase of a binding machine for the last 6-12 months!!! I’ve never seen this brand before — is it easy to use? I am totally with ya on the paper issue — and it is SO nice to have things contained without using binders all the time. I suppose a person could justify the cost of the binding machine when one considers how much money could be spent on binders alone! Oooo I think I need to add that to my homeschool tools too! That is a good “B” thing!!! 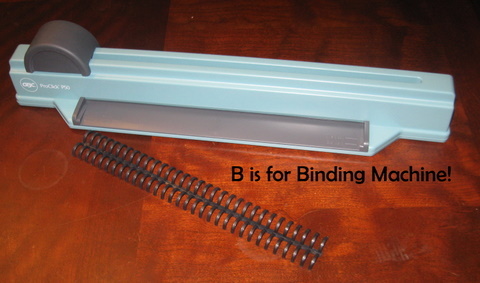 I WANT A BINDING MACHINE!! I am now going on the hunt. Thanks!